Let's talk about weekday mornings. And not just any morning. I'm talking about those mornings where you slept in a little longer than you should have, so now you're madly dashing around the house trying to get ready. And as happy as you are about leaving the house with a moderately wrinkle-free outfit, there's one thing keeping you from rock-star status. Tummy grumbles. That's right, you forgot breakfast. But I don't need to be the one to remind you: your stomach is already doing a good job of letting you (and everyone in the vicinity) know it. And when your stomach is mid war-cry, you want to eat anything in arms-reach to just make it shut up. Right? 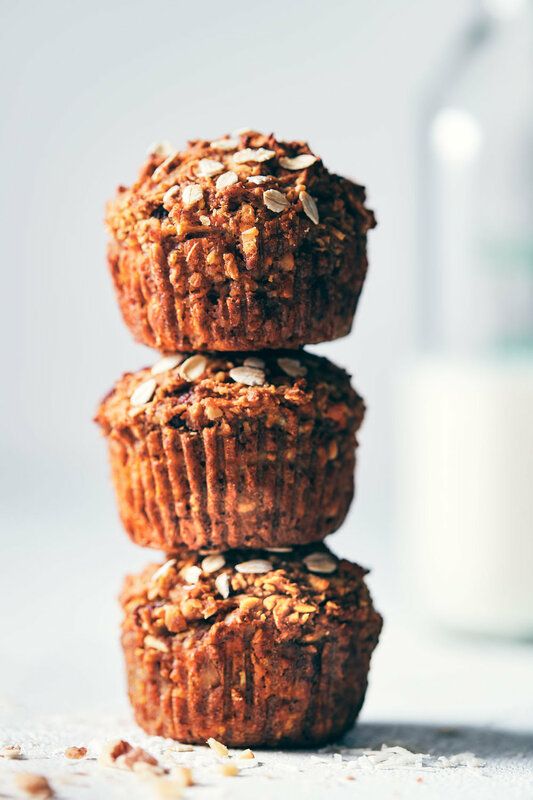 Mornings like these are inevitable, which is why these morning glory muffins are the perfect solution for a quick and nutritious breakfast on the go. Sure, you could buy breakfast from the cafe near work, but we both know it isn't nearly as healthy as it should be. In fact, these homemade morning glory muffins are a far cry from the mini-cakes masquerading as "breakfast muffins" at your local cafe. They’re loaded with nutritious fillings, pack a punch of flavor, and supply you with long-lasting energy to fuel you through your day - even when you’re pinched for time. As you’ve probably come to expect from us, this recipe isn’t just for any old morning glory muffin. It took many rounds of testing to get these vegan, gluten free, and no-sugar-added muffins just right. But now they’re so much part of our regular routine, that frankly it’s hard to imagine how we lived without them. 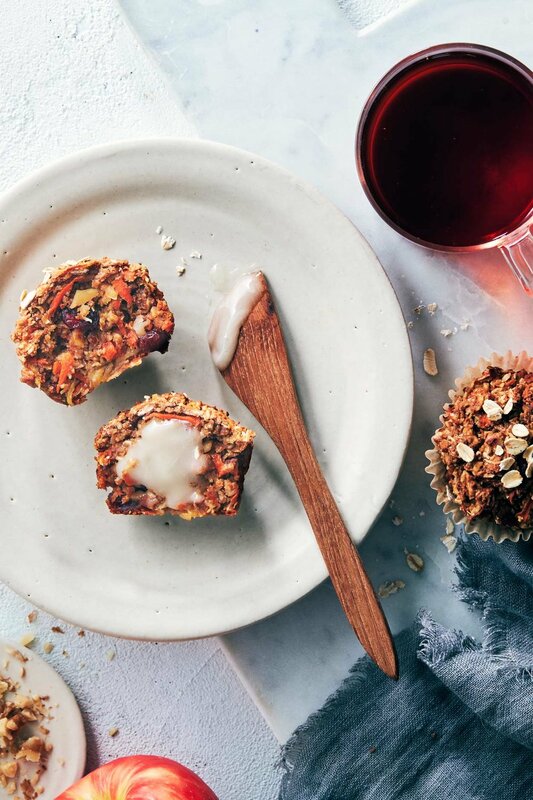 Morning glory muffins are known to have a little bit of everything - like apple, carrots, nuts, coconut, cranberries - so don’t be deterred by the long list of ingredients. Oats keep these muffins gluten free, without the need for expensive gluten free flour blends. Pureed applesauce and dates help bind the dough, and also provide just the right hint of sweetness. We call for Deglet Noor dates (not Medjool) in this recipe. Deglet Noor dates are smaller and cheaper, and often come in larger volumes suitable for baking. Costco has the best priced bag that we’ve found, but they can also be found in the bulk aisle of your regular grocery store. And lastly, these muffins have red lentils in them (yup, lentils!). Don’t worry, nobody will be able to tell there’s lentils inside, but you’ll know they’re doing double duty in the background. First, lentils add a nutritional boost, in the form of protein and fiber. And, secondly, they also keep the muffins moist, meaning we need very minimal oil. Since red lentils cook very quickly, they won’t hold you up from baking, so embrace the lentils and don’t look back! These muffins mean business. Texturally, they’re sturdier than their white-flour-sugar-loaded muffin counterparts. In order to get large, rounded muffin tops like the ones pictured, it’s important to divvy up the batter so that it’s literally heaping out of the muffin tin. It’ll look like a fair bit of batter for 12 muffins, but what you see is what you get, so overfill the tins and use your fingers to smooth out the tops. Once baked, the muffins can be enjoyed on their own (as we most often have them). But if you’re feeling fancy, they’d be great eaten alongside a cup of tea or coffee, and served with a smear of honey, jam, or whatever your heart desires. Preheat oven to 350 °F. Rinse lentils thoroughly. Put in a small pot and cover with 1-2 inches of water. Bring water to a boil, and then reduce to a simmer. Cook for 15-20 minutes, until soft. Once cooked, strain thoroughly to remove all excess water. In a food processor, add 1 1/2 cups oats (150 g) and process until it’s the consistency of a fine powder. Add cinnamon, cardamom, salt, baking powder, baking soda and arrowroot powder. Pulse until blended. Empty mixture into a large bowl. Add remaining 3/4 cup oats (whole) and stir to combine. In the food processor (no need to clean), combine applesauce, dates, and cooked lentils (strained). You may wish to put a kitchen towel over the lid of the food processor, to prevent any liquid from leaking out. Pulse until a smooth puree is formed.Stop when the dates are fully blended into the applesauce. Add vanilla, orange zest and coconut oil. Pulse a few times until well mixed. Pour wet ingredients into dry. Fold the batter until all but ~1/4 of the dry ingredients are visible. Add grated carrot, grated apple, cranberries, walnut and coconut. Mix everything just combined and there's no longer any flour visible. Transfer batter into lined muffin tins, filling each tin until heaping. Use your fingers to shape the top of the muffins into smooth, round domes (see note below). Sprinkle with a bit of extra oats for garnish. Bake for 35-40 minutes, until a toothpick inserted into the muffin comes out clean. Allow muffins to cool for 10-15 minutes before removing from the pan. Place on a baking rack to cool completely. -These muffins do not rise like a traditional muffin, so you’ll need to overfill each muffin cup. The batter is sturdy so you can shape with your fingers for pretty muffin tops and they'll stay put during baking. -*Bring your applesauce up to room temperature so it mixes with the coconut oil. Cold applesauce can cause your coconut oil to solidify.